It's not easy making a legendary movie love scene. The dialogue must be beautifully written, the actors must have once-in-a-lifetime chemistry, and the film crew's execution must support the emotion of the moment. To earn a spot on a "best" list, a movie love scene passes these tests, is beloved by the public, and it becomes a timeless fixture in popular culture. Casablanca is often ranked the best movie of all time and for good reason. The famous love scene on the foggy Moroccan airport tarmac when Rick (Humphrey Bogart) says to Ilsa (Ingrid Bergman), "Here's looking at you, kid," has been repeated so often it is easy to forget the context. It wasn't just the legendary words or acting chemistry, it was the story. Earlier in the film the "Here's looking at you, kid" line was what Rick said to Ilsa just before they parted in Paris. When fate brought her into his life again, he had the chance to get her back. However, in that final moment, he selflessly has her escape with her husband because he knows if she stays in Casablanca with him she'll be in danger and miserable. That heart-wrenching moment when he chooses her happiness over his heart's desire is delivered effortlessly. It's beautiful, memorable and heartbreaking all at once. Roman Holiday, an all-time great movie that launched Audrey Hepburn to stardom, was filmed in Rome and is full of iconic moments. Joe (Gregory Peck) and Princess Ann (Audrey Hepburn) meeting on the Spanish Steps, riding the scooter, putting their hands in the stone mouth of La Bocca Della Verita, and dancing at the party on the barge. However, the most romantic, heartbreaking moment of the film is when Princess Ann's day of escape is ending. As she realizes she has fallen madly in love with Joe, she must leave and return to the palace. The mix of heartbreak and desire on the faces of Hepburn and Peck as they hold each other, never wanting to let go but knowing they must, sets the movie screen on fire with bittersweet romance. This epic story of unrequited love overflows with powerful moments between Dr. Zhivago (Omar Sharif) and Lara (Julie Christie), but the most memorable is when the two would-be lovers enter the doctor's old home, which has turned into an ice palace. The moment is haunting and symbolic, as this critic puts it: "This ice palace, like their love affair, is breathtakingly beautiful to imagine, but in the end, impossible to inhabit." 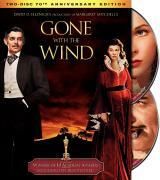 Only Gone With The Wind outdoes Doctor Zhivago in epic length and scope. "I've loved you more than I've loved any woman, and I've waited for you longer than I've waited for any woman." This is the line that Rhett (Clark Gable) says to Scarlett (Vivien Leigh) just as he's about to leave for battle. It's a scene for the ages, with the passionate red-glowing light of the horizon covering their faces as they hold each other in that iconic embrace that became the most memorable image from the film, often used on the cover of the movie. Standing on the opposite end of the spectrum from Gone With The Wind is the quirky '80s teen romance Say Anything. Although this film didn't win multiple Oscars, the endearing charm of Lloyd (John Cusack) lifting a boom box over his head to blast In Your Eyes by Peter Gabriel outside the window of his true love Diane (Ione Skye) is regularly ranked among the top romantic scenes. If there's one animated film that deserves a spot on this list, it is Disney's 1991 classic Beauty and the Beast. Belle, the bookish protagonist, is ranked one of the best movie heroines of all time. It is therefore not surprising that her timeless ballroom dance with the Beast, which earned an Academy Award for its song Beauty and the Beast, is regularly recognized by the public as one of cinema's most romantic scenes. Besides its visual beauty (it was Pixar's first work in a feature film), it's the first time you see a powerful spark between the unlikely couple. That first kiss from the person you love can send you floating on cloud nine for days. One of the best films of all time, Singin' In the Rain, has an entire scene dedicated to this overwhelming post-kiss euphoria. Don's (Gene Kelly) first kiss with Kathy (Debbie Reynolds) after he walks her home begins the scene. The thrill of love sends Gene Kelley tap-dancing into the rain in one of the most legendary scenes in movie history (and one of the most romantic when you consider its context). The Princess Bride and its irresistible charm has become one of the most beloved, oft-quoted romantic movies in recent decades. The film's narrator describes the climactic kiss between Westley (Cary Elwes) and Buttercup (Robin Wright) as the greatest kiss in history. The momentous kiss in the film's final moments is the capstone on one of the most popular films ever made. The American Film Institute ranks West Side Story among the top ten romantic movies of all time. By far the most iconic scene is the heart-melting ballad, Tonight. Tony (Richard Beymer) shows up below the window of Maria (Natalie Wood) to confess his love to her, and it sets up the beautifully-written song that has become one of the story's most beloved moments. The famous scene in which Rose stands on the bow of the Titanic with Jack before they kiss has become iconic in popular culture. However, it takes more than just an attractive couple on a big boat at sunset to make a scene earn its place on a "best" list. That magical scene was surrounded by greatness: composer James Horner's brilliant Oscar-winning score, director James Cameron's grandiose vision and use of state-of-the-art technology, and the film's ominous historical background make this scene especially romantic and powerful.